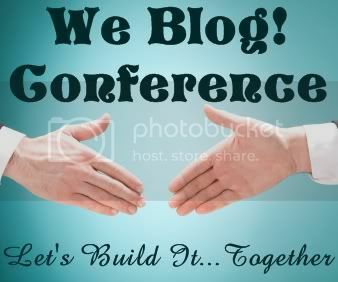 Have you heard about the new conference for bloggers? Kelli (3 Boys and a Dog) and Jyl (The Post-It Place) have come up with a new concept in blogger conferences. We Blog promises to have not only basic and intermediate classes, but more advanced classes as well, less cost, and more time to network. Right now they're running a contest for 8 bloggers to join a Focus Group and attend a mini-conference in May 2010. It's being held at the Glenstone Lodge in Gatlinburg, TN, and--thanks to Diamond sponsor Discovery--nearly all expenses for the winners will be paid! Contest winners will be chosen "based on their heart, their writing skills, and more... not just on the number of readers they have! We want a wide range from fairly newbies all the way through majorly established!" Interested? You can find more details, including how to enter the contest, at the We Blog Conference website.